Comic-watch.com is dedicated to bringing a fresh and honest perspective to the world of news and reviews for comic books, television, movies, anime, gaming, and more! In an industry full of noise, our voice is clear. Welcome to Comic Watch: The Age of Comics and Entertainment! Problem: Comic Watch needed a way for its authors to submit review articles to the website for publication. Some of the reviews needed to have the ability to be rated by the author and properly categorized. Solution: We developed a customized plugin solution that hooked into both the AccessPress Anonymous Post plugin and the WP Review Pro plugin, allowing both plugins to work together. 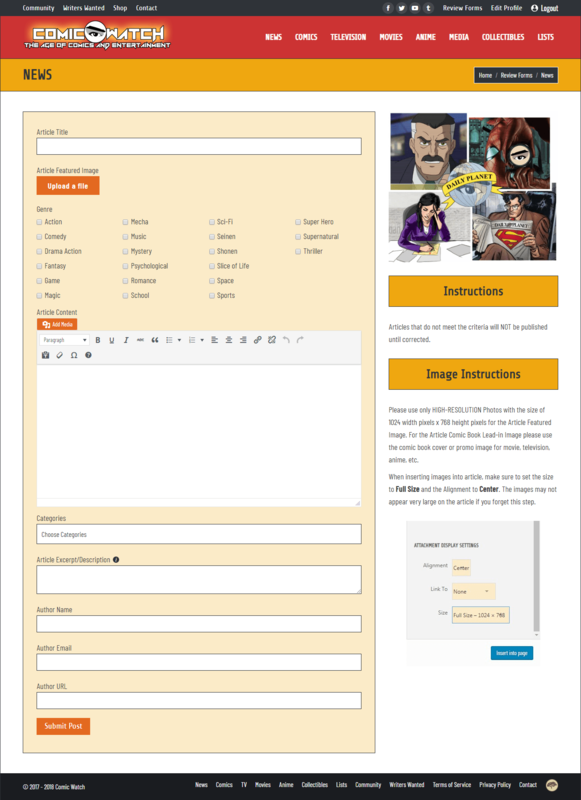 Each type of top-level review category on the website now has a form that the authors can use to submit the content, including the images, article copy, and meta information. Problem: Because Comic Watch planned to submit the website to Google News, the client wanted to add Accelerated Mobile Pages (AMP) to the website. Solution: We used the plugin AMP for WordPress and customized it to match the theme being used on the website.